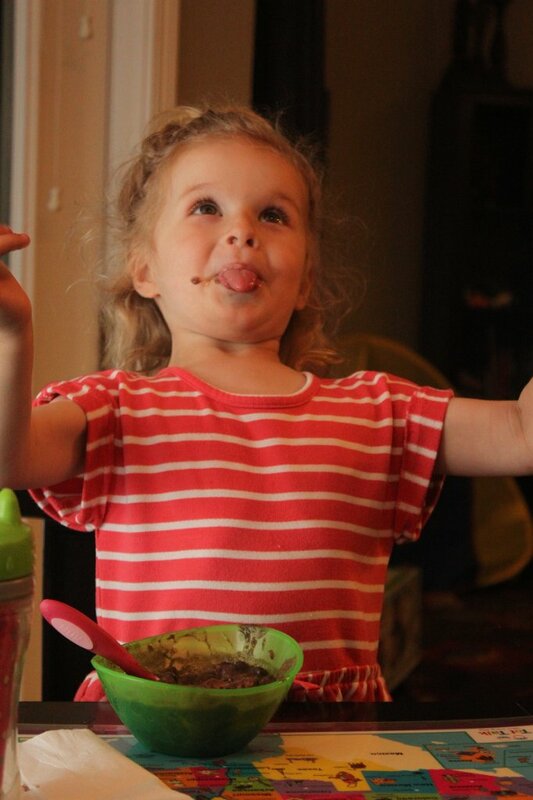 Our family doesn’t usually eat meat-free meals just because we always a meat/protein. If your family aren’t big meat-eaters or they are willing to try a vegetarian meal, slow cooker black bean soup is a good one! I will say we used chicken stock but it could be swapped for vegetable stock easily. 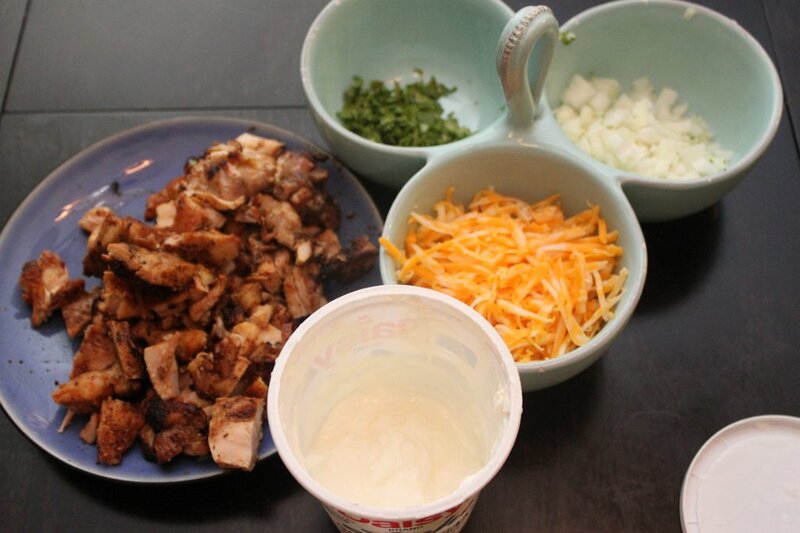 Also, I used grilled chicken thighs as a topping so be forewarned when you see the pic! 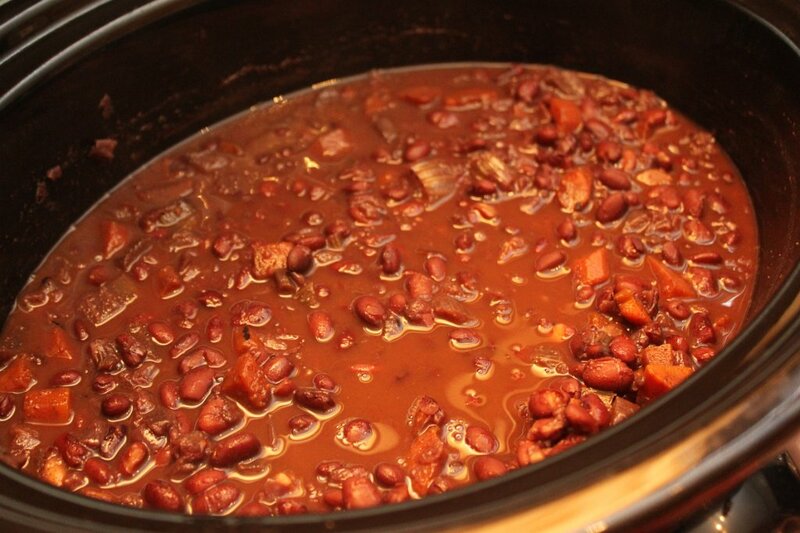 Also, I am drawn to this recipe since it uses dried beans instead of canned. 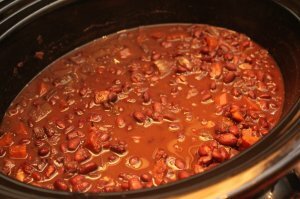 I love the idea of using dried beans but I can never seem to remember to soak them the night before. 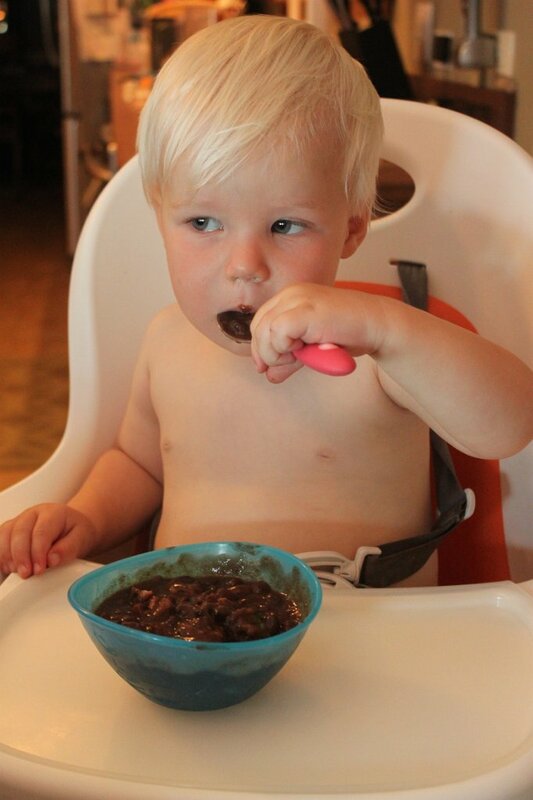 This is why I usually cook with canned beans. I guess you can call it laziness or just busy, you decide! Warm the oil in a large skillet over medium heat. 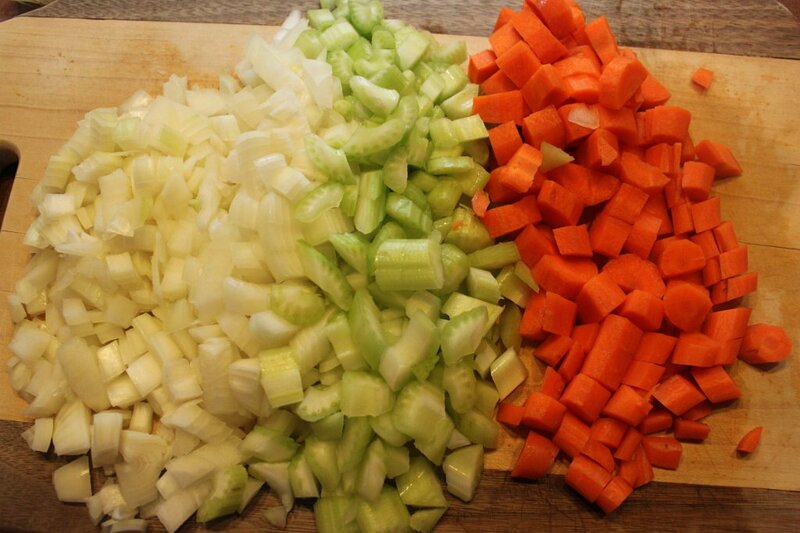 Chop onion, celery, and carrot. 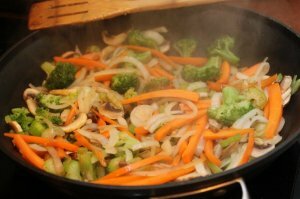 Add the chopped vegetables to the pan and then minced (or garlic-pressed) cloves of garlic with cumin, pepper flakes and salt. 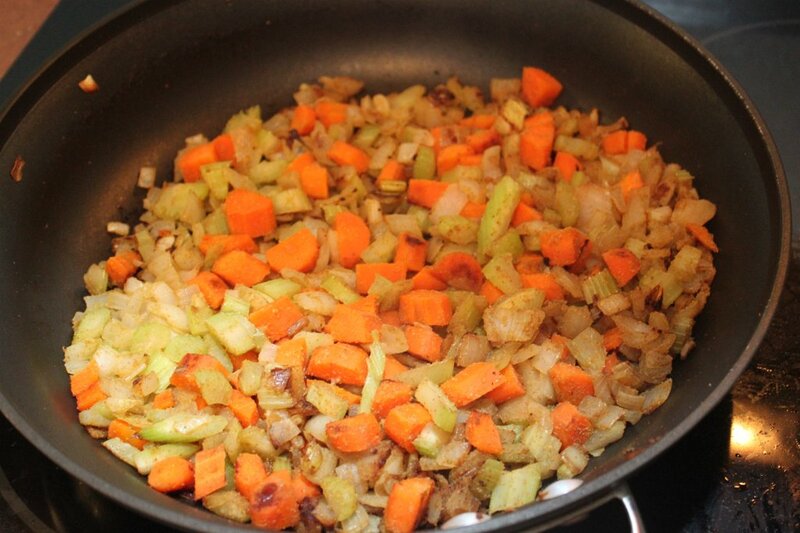 Cook until everything has softened and lightly browned, 10-12 minutes. 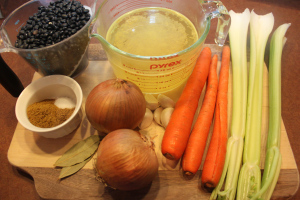 Add the vegetables, water, broth, black beans, and bay leaves to the slow cooker. Stir to combine everything. Cover and cook on low for 9-10 hours or on high for 6-7 hours. After the time is done, remove bay leaves. 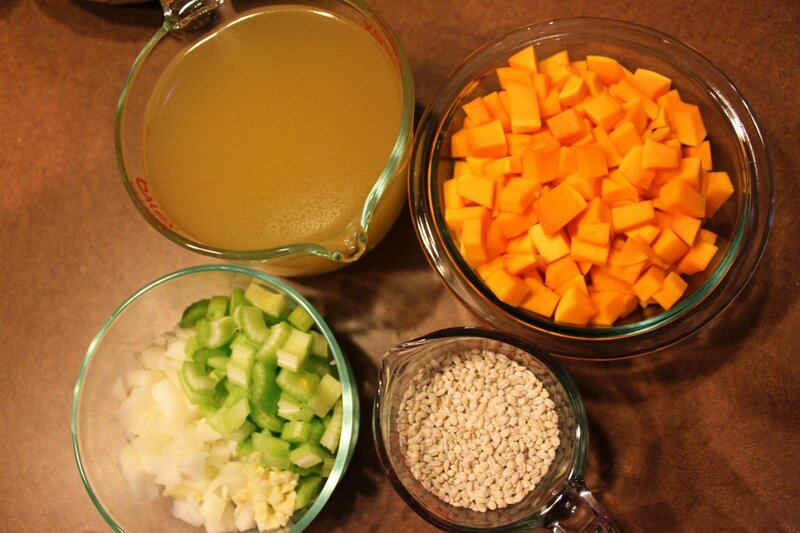 Ladle out 2 cups of soup and puree in a blender or with immersion blender until smooth. Stir back into rest of soup. Season with cilantro, and also salt and pepper if needed. Serve and top with toppings as desired. Enjoy! Dried black beans become a delicious hearty soup in this slow cooker recipe. Warm the oil in a large skillet over medium heat. 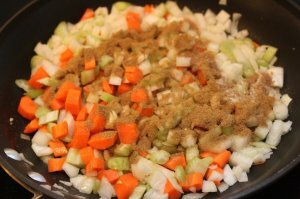 Chop onion, celery and carrot. Add the chopped vegetables to the pan and minced cloves of garlic with cumin, pepper flakes and salt. 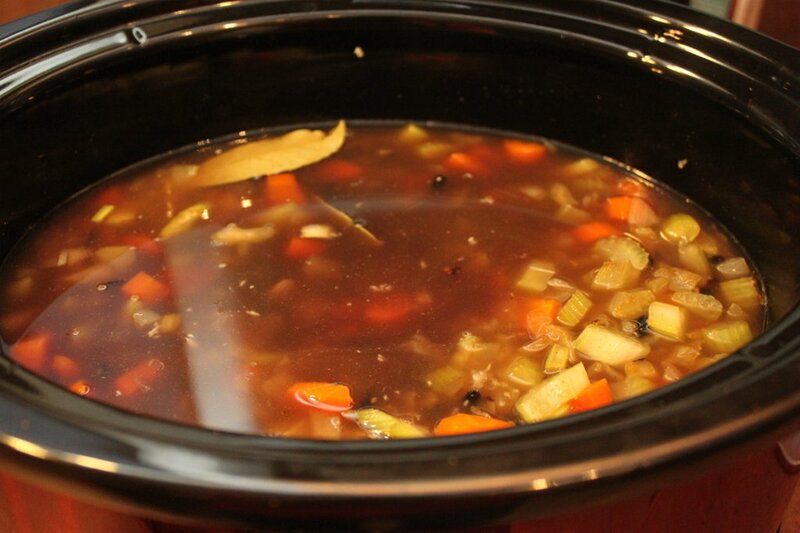 Add the vegetables, water, broth, black beans and bay leaves to the slow cooker. Stir to combine everything. Cover and cook on low for 9-10 hours or on high for 5-6 hours. After time is done, remove bay leaves. 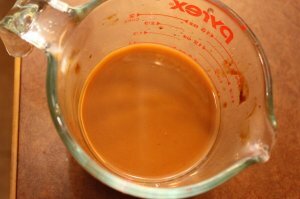 Ladle out 2 cups of soup and puree in a blender or with immersion blender until smooth. 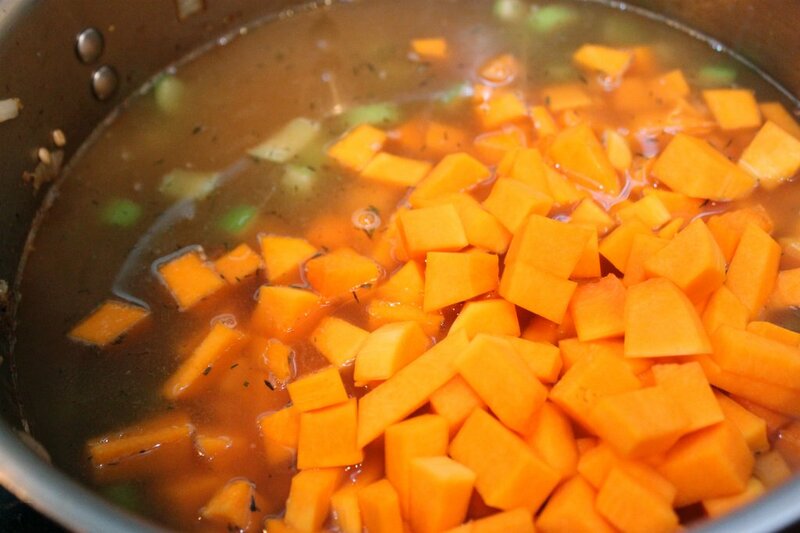 Stir back into rest of soup. Season with cilantro, salt and pepper. Serve and top with toppings as desired. My kids love this kind of stuff! Each one asks for more cheese or more sour cream, whatever they like! For those of you that have been wondering, ‘why haven’t I been receiving the post emails?’ Well, I haven’t been posting much, that’s why! 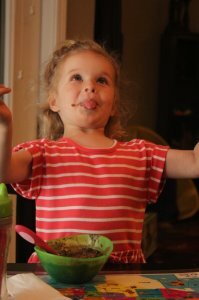 Lots of changes have been happening in our household and we’ve been traveling and visiting family quite a bit. Thankfully, I feel like I’m finally getting my groove back! Thanks for the continued support! 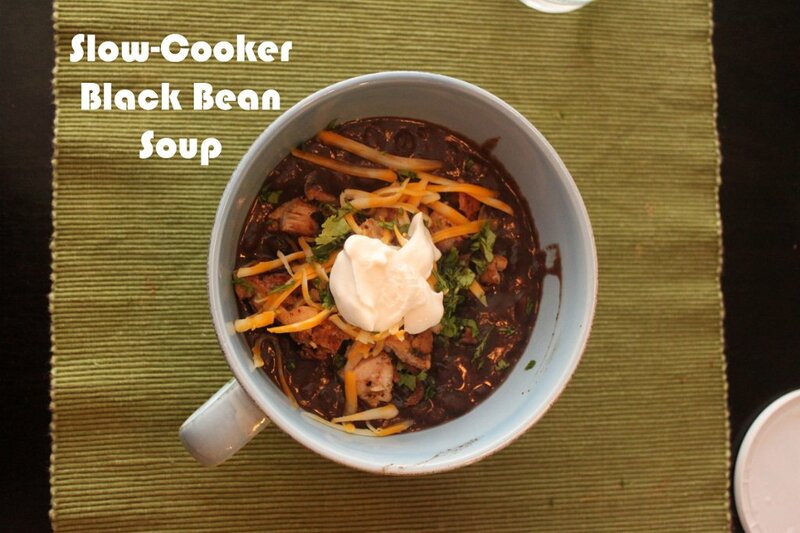 Please let me know what you think about the Slow Cooker Black Bean Soup! I’d love to hear what you think! So happy Spring has arrived! 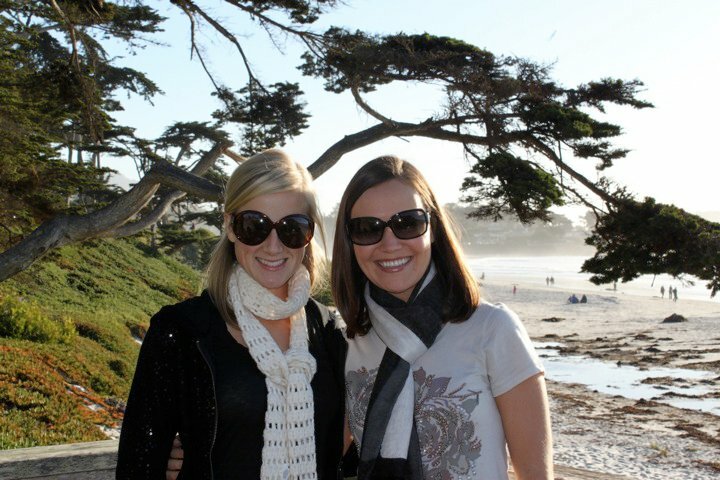 We spent both days of this weekend outside in the sunshine! 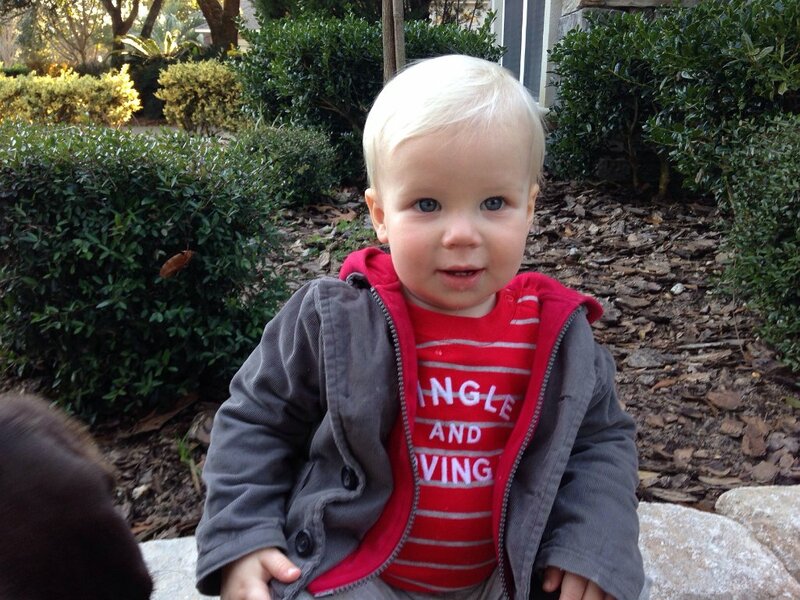 On Saturday, we had Harper’s soccer game and a birthday party at a playground. Then Sunday, we were cleaning up the porch and front yard after church. I even got a tiny sunburn on the back of my neck since my hair no longer covers it now that my hair is all gone! 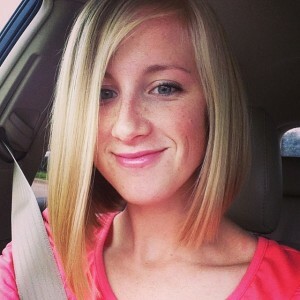 I must have cut off 8-9 inches in the back! Anyways, we also said a very sad goodbye to our dear, dear friends who moved to Jacksonville. Our children have grown up together and it’s just so sad now that they aren’t around the corner anymore. Life will be a lot less exciting without them but we both know we will get to visit each other since it just a quick 5 hour drive down I-10 from us! Haha! 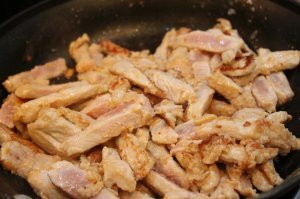 So the matter at hand: Pork Stir Fry. As I am emptying out my back log of recipes, this one is a more recent one I have fixed. 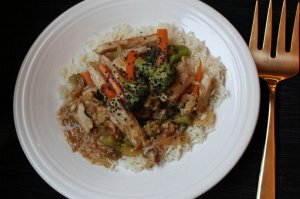 Its one I know many people have a similar type of dish already; but since I love to share my own recipes, maybe its a little different from others out there! On another note, if you have everything prepped and ready for this meal, you can make Pork Stir Fry in a flash! I’d say less than 20 minutes! That’s better than take out for sure and it tastes just as good! Whisk together egg, rice wine vinegar, soy sauce and cornstarch. Add in the pork (or other protein) and set aside. 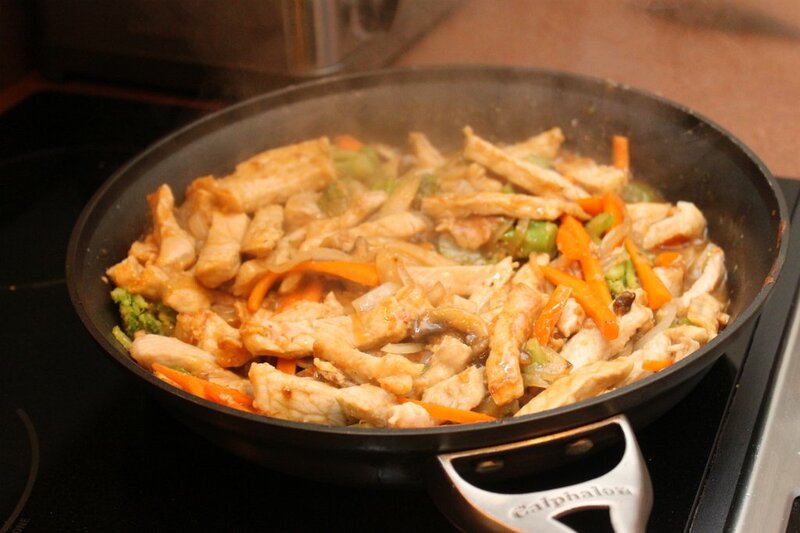 Mix up the sauce and place in area next to stove along with the vegetable and pork. Heat 2 TBL of oil in large skillet or wok. Add pork and brown until no longer pink, 1 1/2- 2 minutes, (should still be underdone). Remove to a plate and set aside. Make sure pan is HOT and add remaining 1 TBL of oil. Add garlic and saute for 30 seconds. 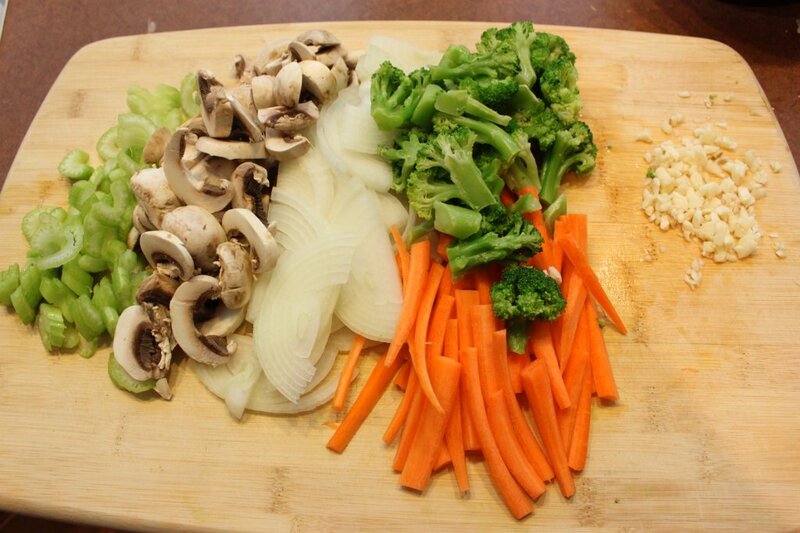 Add all the vegetables along with a pinch of salt and sugar. 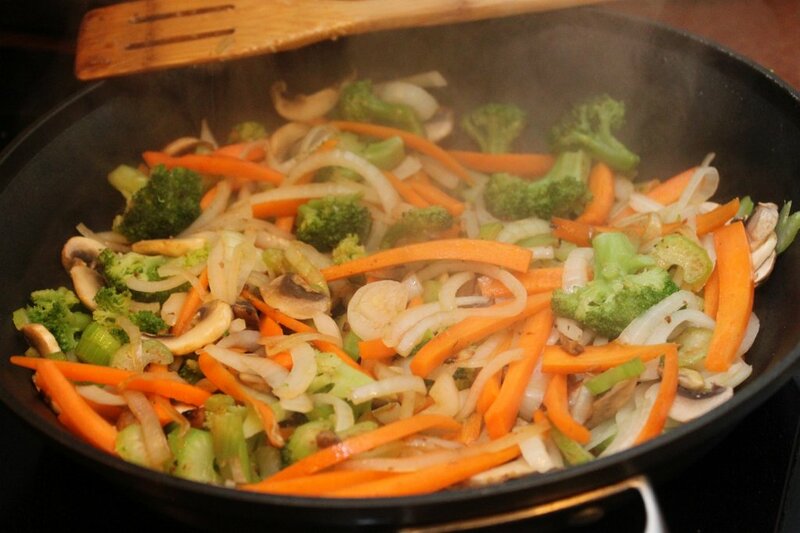 Stir fry until crisp-tender about 2 minutes. Add the pork and pour in sauce and stir. Everything should start to thicken up by about 3 minutes. Move to plate and sprinkle any garnishes on top. Serve on top of white (or brown!) rice and Voila! 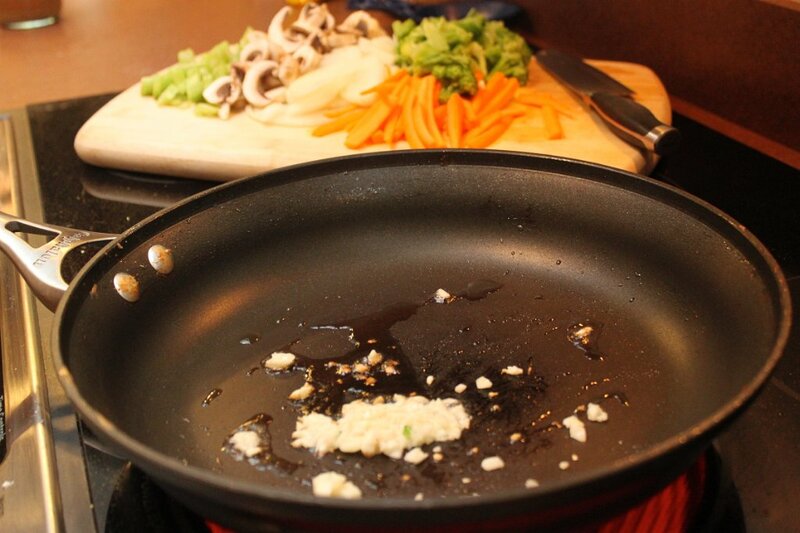 Heat 2 TBL of oil in large skillet or wok. 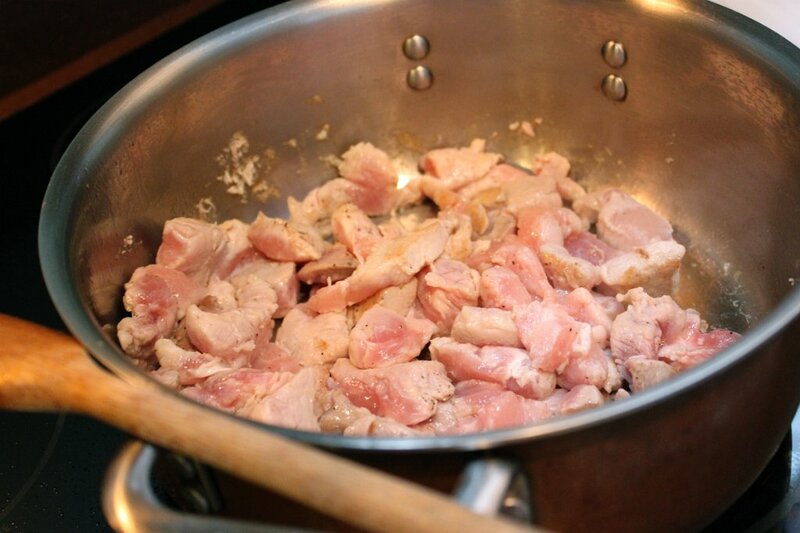 Add pork and brown until no longer pink, 1½- 2 minutes. (should still be underdone) Remove to a plate and set aside. Move to plate and sprinkle any garnishes on top. Serve on top of rice. 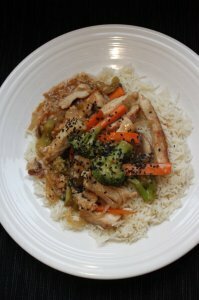 Please let me know what you think of the Pork Stir Fry! 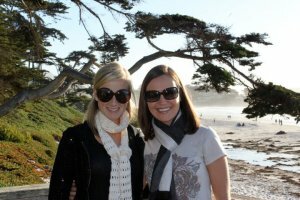 I would love to hear your comments! It was a rough few days several weeks ago when our kids got sick. There are so many people getting sick or the flu or whatever contagious junk is spreading around. It’s a rough year for the sickies! I’m very glad that we are feeling back to normal! 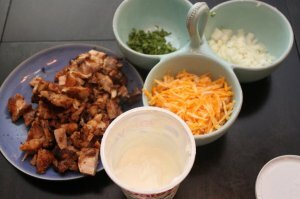 This isn’t my typical recipe with all the before and during pictures. I had a touch of something and couldn’t get it all together. Thankfully I was feeling better shortly afterwards and thought, this might be helpful to anyone is the same situation as me! 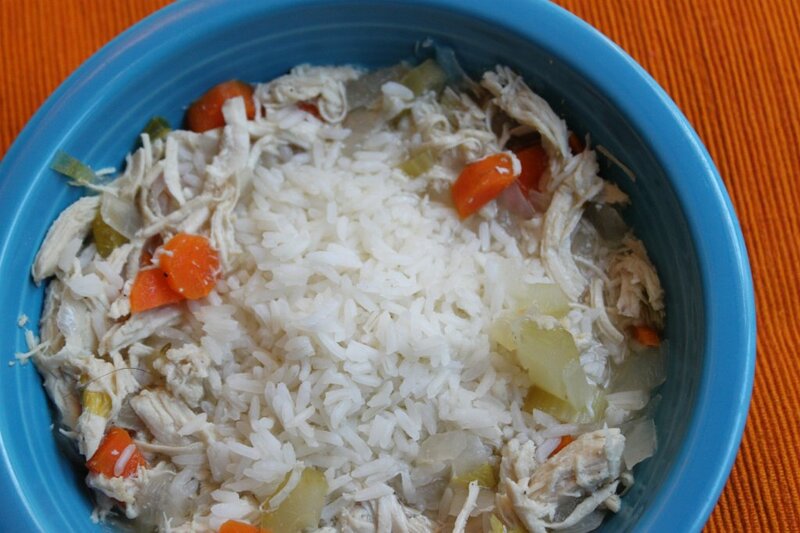 Crock pot Chicken Soup with Rice. Its a mouthful so I’m calling it Healing Chicken Soup. Since I made it to heal my poor sick family. I made this soup to be mild but hearty. I know everyone has a favorite chicken soup recipe but I like to make mine this way. Start by roasting the chicken breast in a 400 degree oven for 30-45 minutes depending on the size of chicken breast. Let cool and cut meat off bones, leaving meat as whole as possible. Bones can make more stock later on! 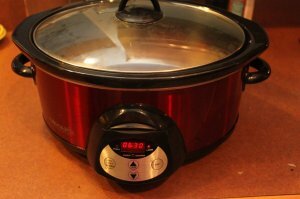 Place chicken, all veggies, stock, thyme and salt and pepper in crock pot on high for 4-5 hours or low for 6-8. When almost ready to eat, cook rice in water. Take chicken out of broth and shred and return to crock pot. To serve, put soup in bowl and add a scoop of rice on top. Store leftover separately and rice won’t get mushy. You end up with a simple, delicious broth soup that has lots of chicken flavor and not too salty or heavy like many canned varieties. It was so enticing, Calvin couldn’t help himself from a carrot or two! 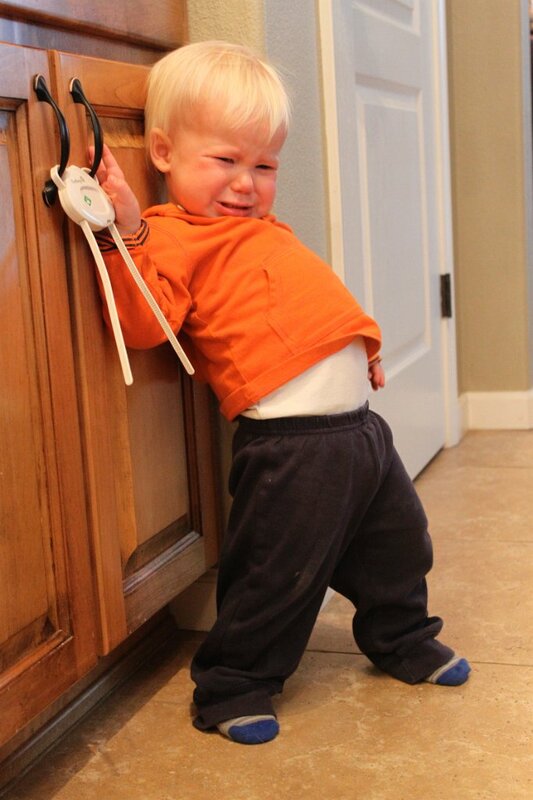 And when I tried to run him off to finish photographing, he threw a huge tantrum! But we ate lunch and he was much better! Although I don’t have a picture to prove it! We went out side a few days later and here he is all smiles. When almost ready to eat, cook rice in water. 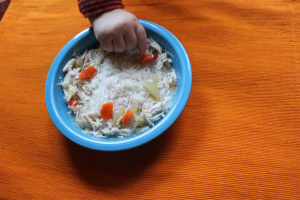 Take chicken out of broth and shred and return to crock pot. To serve, put soup in bowl and add a scoop of rice on top. Store leftover separately and rice won't get mushy. Hope you can keep this around whenever you need it, and I pray that’s not anytime soon! Please let me know what you think about the Healing Chicken Soup. I love to read any and all comments! Thank you to all who responded to the Thanksgiving poll! It looks like 2/3 of voters would prefer to have a mixture of both traditional and new. I’m still compiling my recipes to test and narrowing down what we will “break bread” over on Thanksgiving day. Can’t wait! For now, I’ll keep posting my meals, just the same. 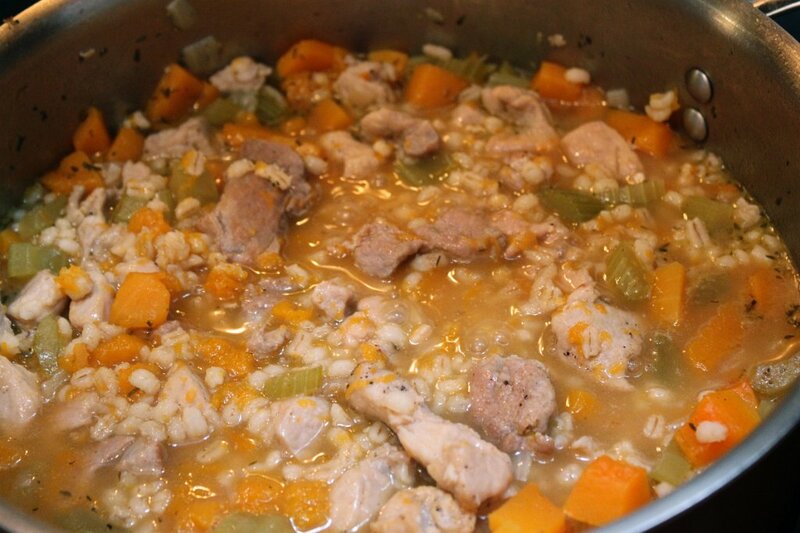 I made a pork and barley soup last night that turned out just so yummy and filling. Since the weather has turned cold here in Florida (for the time being!) I love to eat things like this. Salt and pepper pork and heat 2 tsp of oil in large pot on medium high heat. 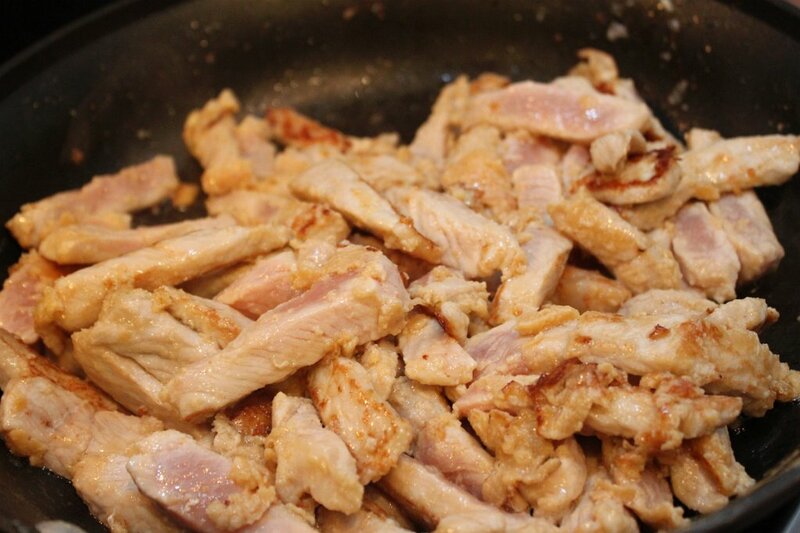 Cook pork for 4-5 minutes. 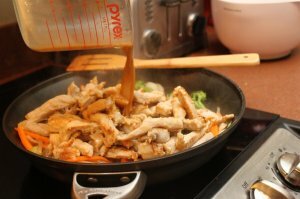 Remove meat to plate, reserving juices in pan. Set meat aside. 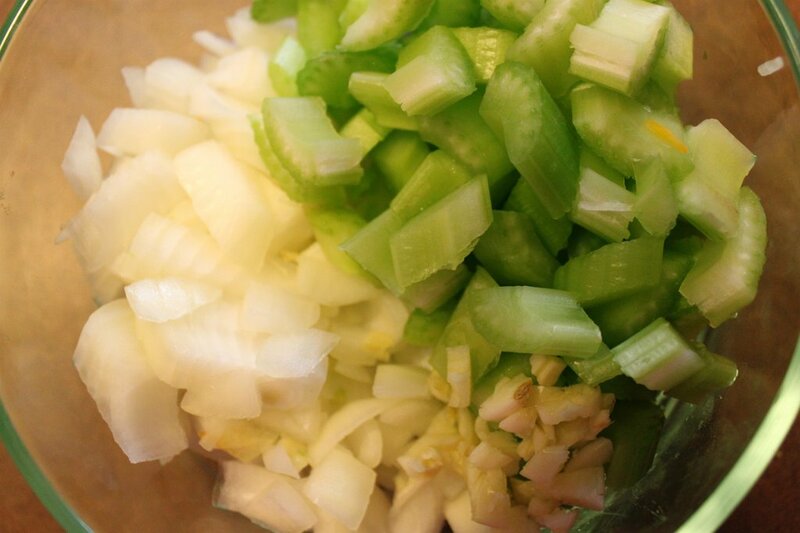 Add onion, celery and garlic to pan and saute for 3 minutes over medium low heat. 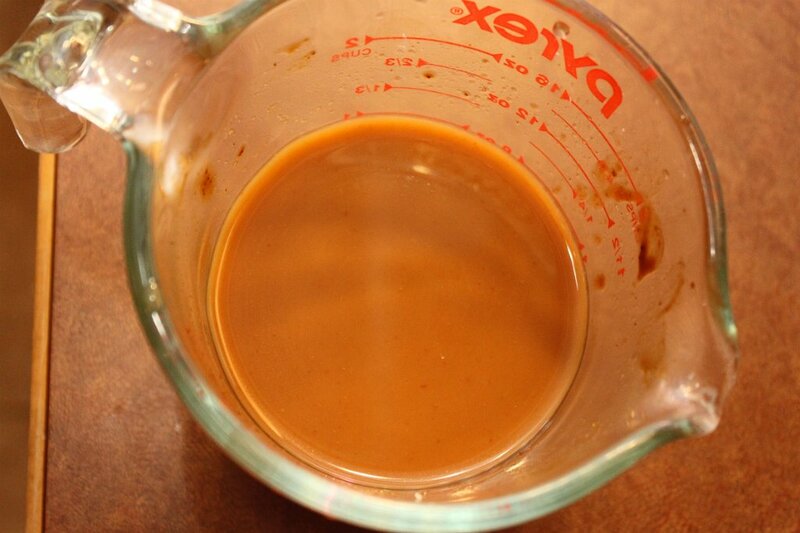 Add remaining 1 tsp oil, and stir to incorporate. 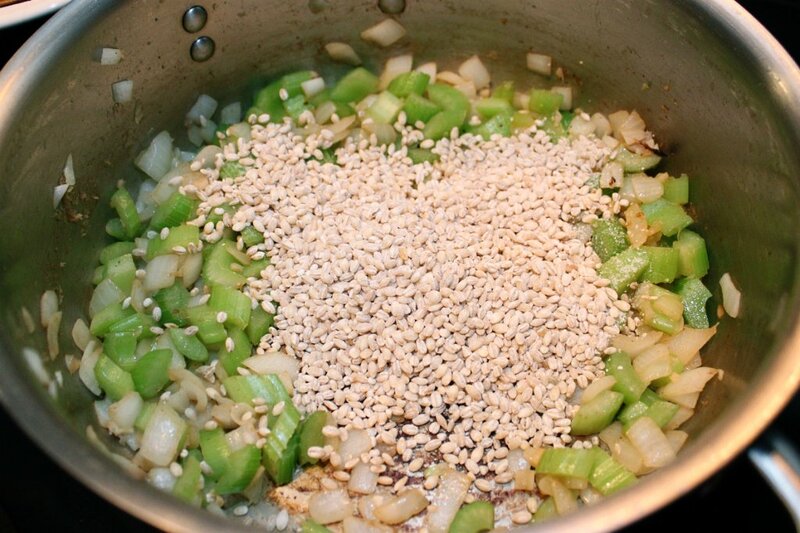 Add barley and thyme, cooking for 2 minutes. Add 1/2 cup of chicken broth and scrape any bits off of the bottom. Add remaining 4 cups of broth and squash and bring to boil. Add pork and cover. 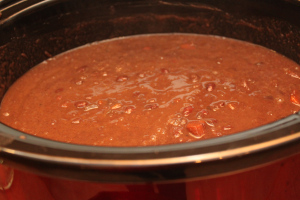 Turn heat to simmer and cook for 40-45 minutes. Barley will soak up more liquid the longer it sits. 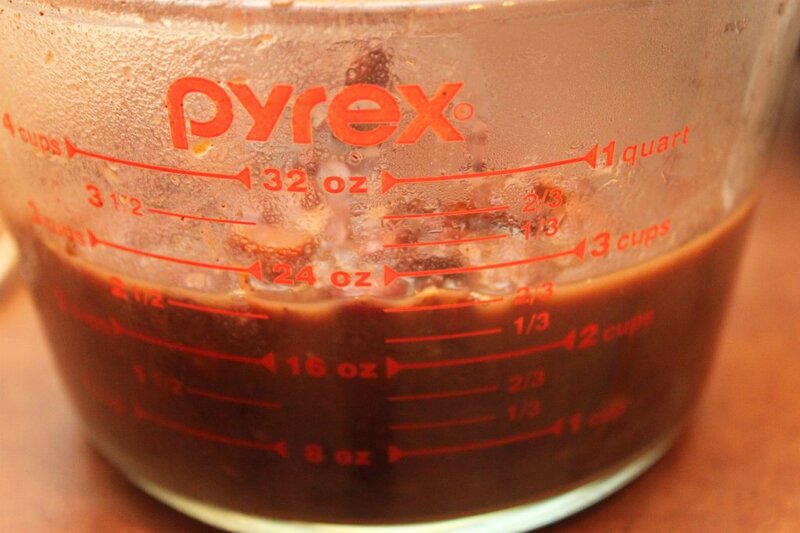 I sometimes add a little broth when reheating the next day to make it the right consistency. A few parmesan shavings are pretty yummy on it as well! 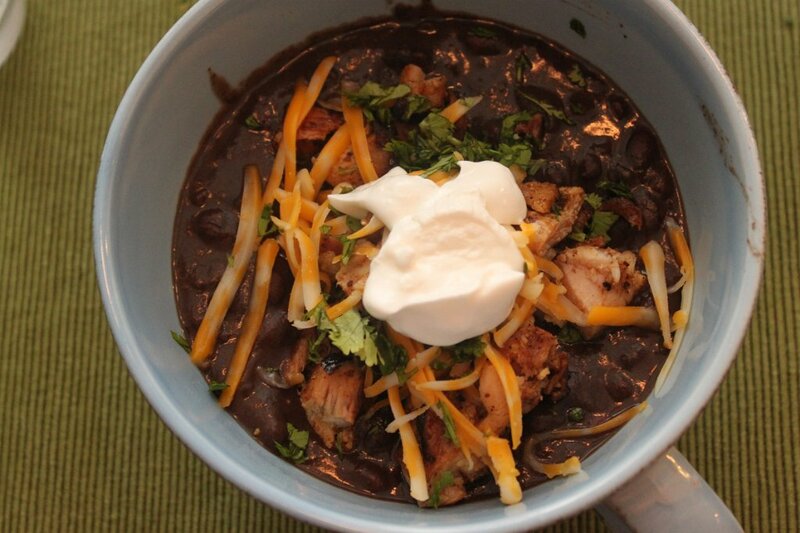 Rich, filling and hearty, just what a cool, fall day calls for! Salt and pepper the pork. Heat 2 tsp of oil in large pot on medium high heat. Cook pork 4-5 minutes until mostly cooked through. Remove meat to plate, reserving juices in pan. Set meat aside. Add onion, celery and garlic to pan and sauté for 3 minutes over medium low heat. Add remaining 1 tsp oil and stir to incorporate. Add barley and thyme, cooking for 2 more minutes. 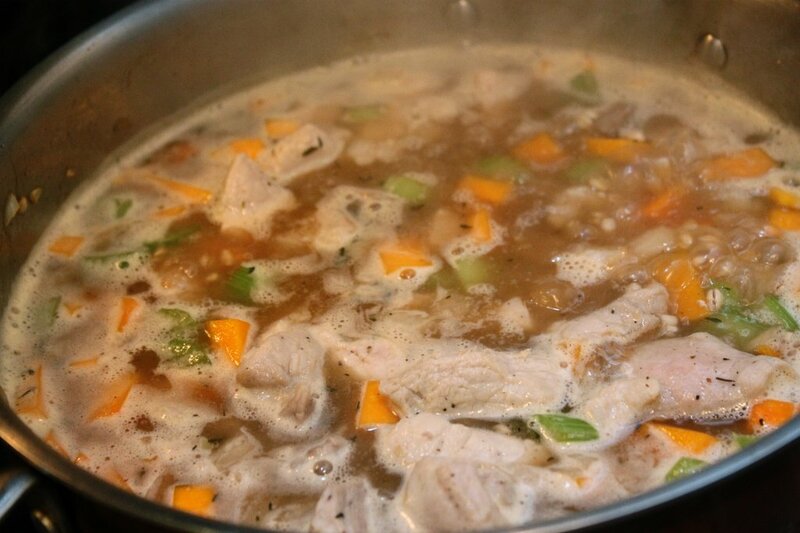 Add ½ cup of chicken broth and scrape any bits off the bottom. Add remaining 4 cups of broth and squash and bring to boil. Add pork and cover. 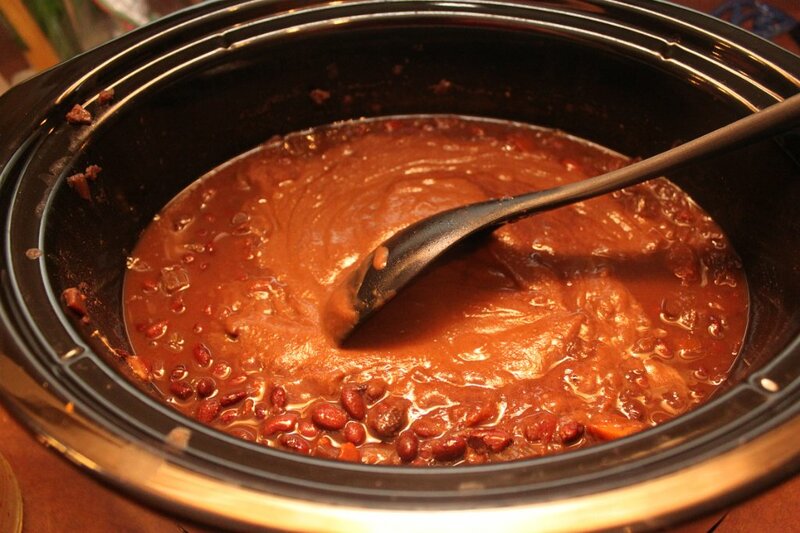 Turn heat to simmer and cook for 40 minutes. Barley will soak up more liquid the longer it sits. Additional broth might be necessary when reheating cooled leftovers to achieve correct consistency. 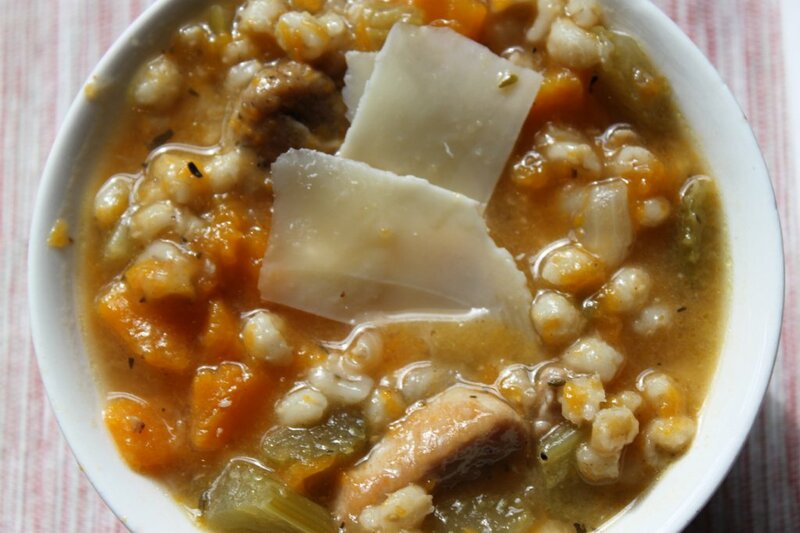 I would love to hear what you thought of my Pork and Barley Soup! Please feel free to leave a comment!